View of the facade from the SSW with Mr Stratford Halliday, RCAHMS. View of the standing stone and the SSW side of the cairn. 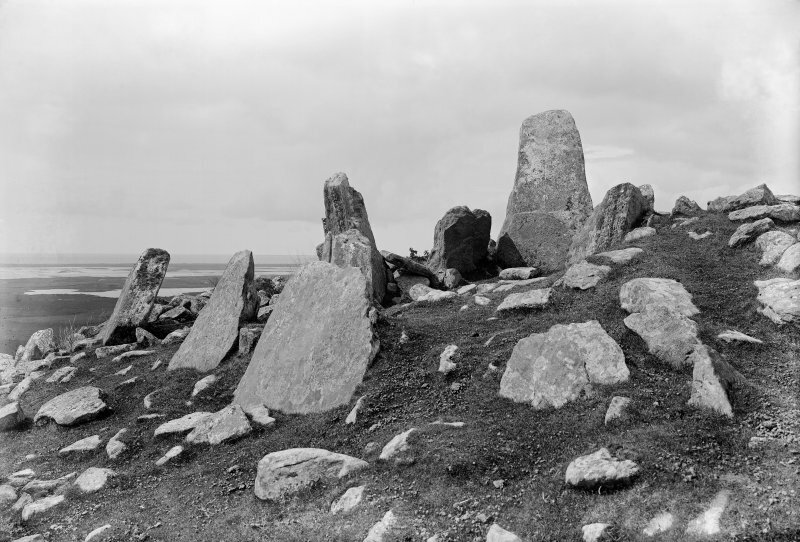 Chambered cairn and stone circle, Leacach an Tigh Chloiche, Unieval. 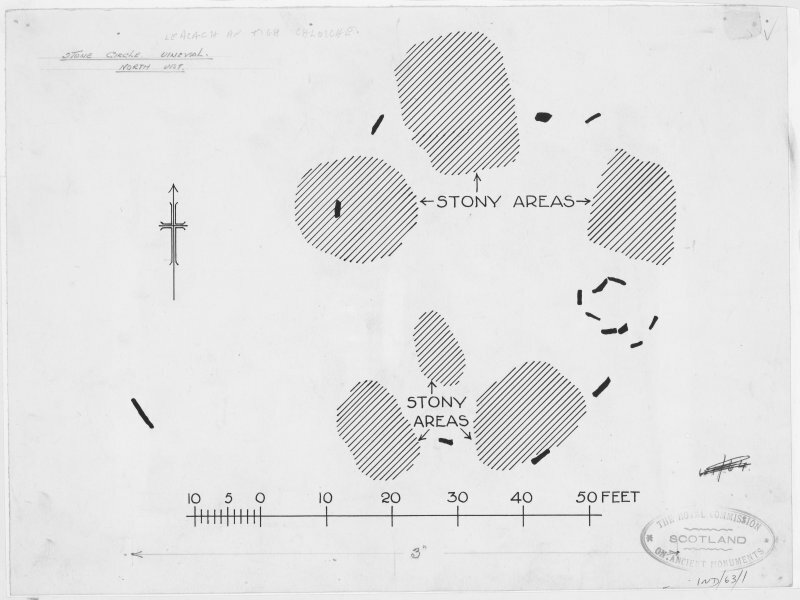 Publication drawing; plan of stone circle at Unival. 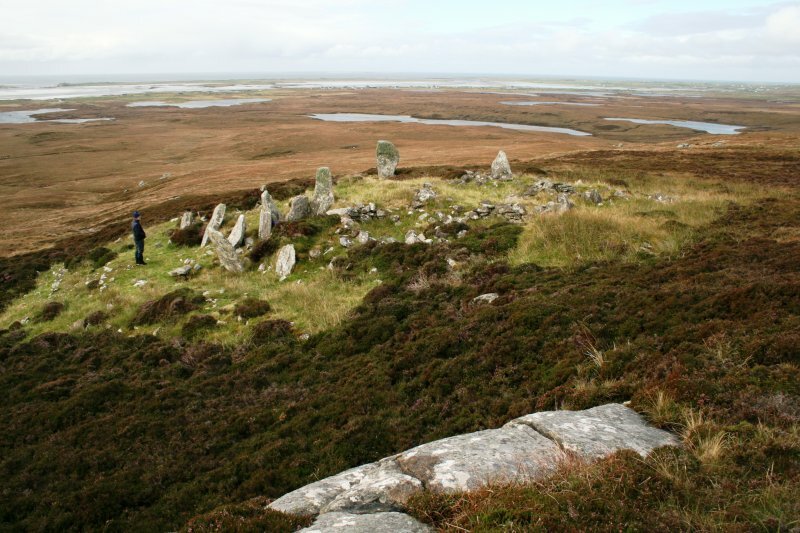 General view looking down onto chambered cairn. View from the SE showing the two orthostats marking the entrance. View of cairn facade and chamber. 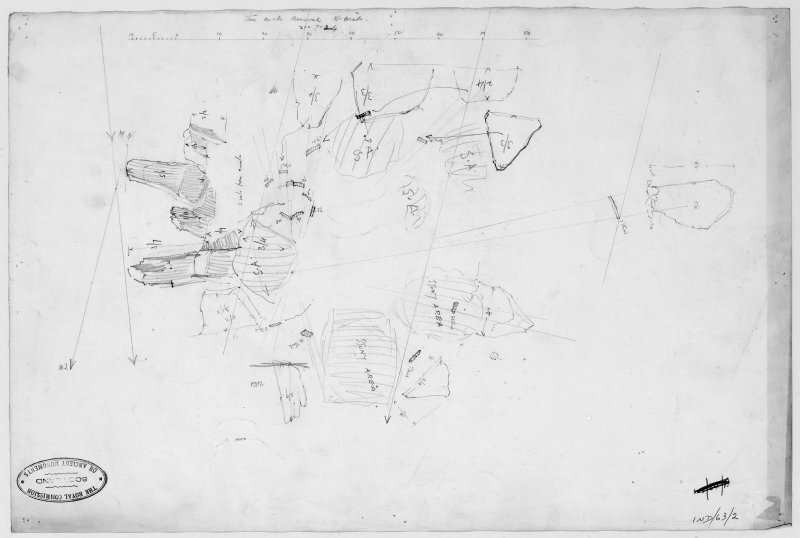 Survey plan and sketch elevations; stone circle, Unival. 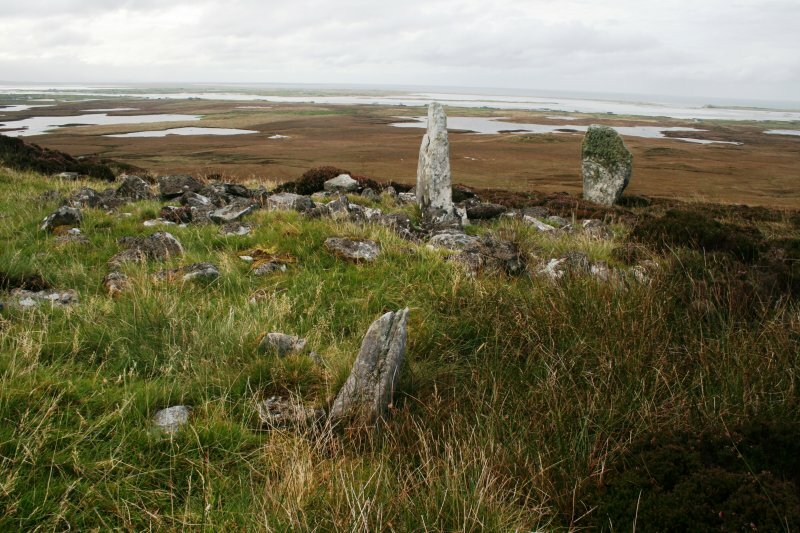 View of the standing stone to the WSW of the cairn. See also NF86NW 18 (Iron Age house). 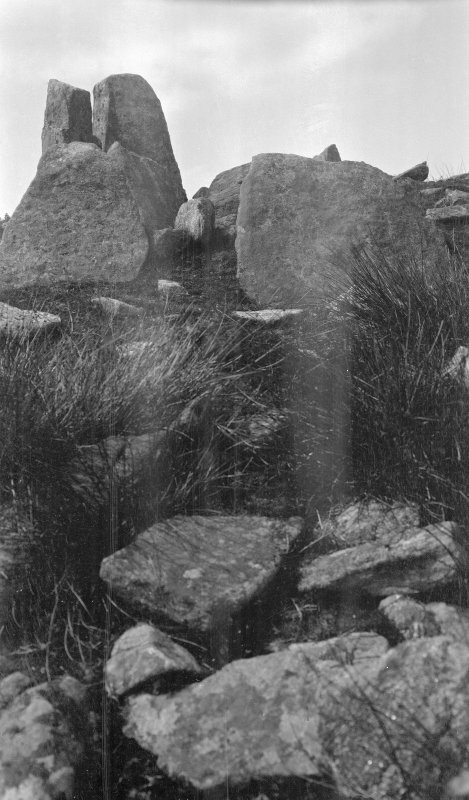 A square cairn, with a Hebridean type chamber, excavated by Scott in 1935 and 1939 (W L Scott 1950). It measures 53ft (16.1m) along each side and 4ft (1.2m) in maximum height. The facade in the ESE and the peristalith, where visible, are of orthostats alternating with drystone walling. The chamber, entered through the facade, contained a cist-like structure with inhumations. Pottery from the cairn included Grooved Ware, Beaker and Cinerary Urn as well as its definitive round-based ware. 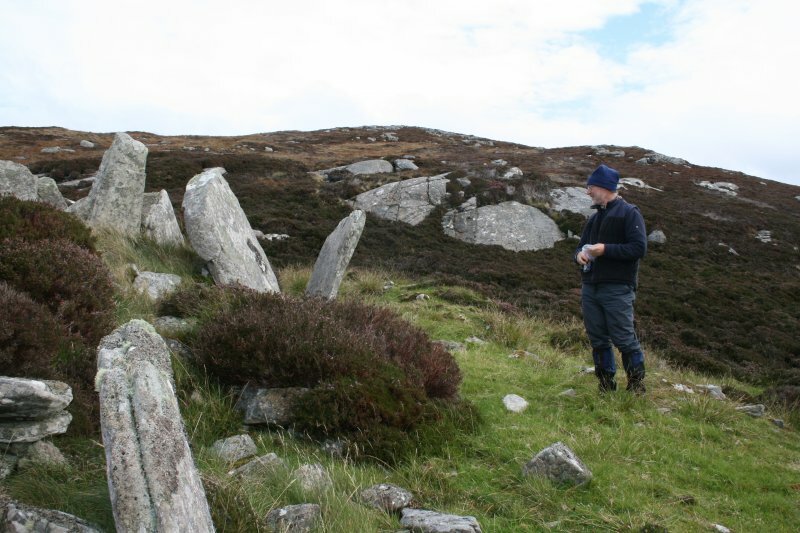 Some 23ft (7m) from the SW corner of the cairn is a standing stone, 10ft (3m) high and 5ft (1.5m) wide, facing the centre of the cairn. In the early iron age a stone-walled house (NF86NW 18) was built into the NE corner of the cairn. E Beveridge 1911; RCAHMS 1928; W L Scott 1948; A S Henshall 1972. Several upright stones can be seen halfway down the profile of the hill. It is a complex monument with an earlier chambered tomb and the remains of a later iron-age house. 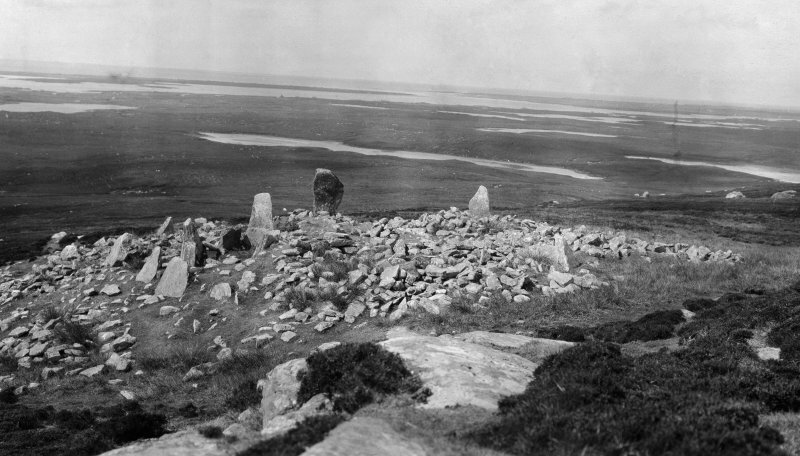 The cairn is low and square, some 16m on each side. Some of the upright kerb-stones marking the edge still remain, with drystone walling between them, while others have now fallen. On the south-east side more remain and they increase in height towards the centre, where a short narrow passage leads into an irregularly shaped chamber of upright slabs measuring about 1.8m by 2.2m and now roofless. Excavation in 1935 and 1939 produced parts of the skeletons of two people from the chamber, and a large number of sherds from several different neolithic pots, a stone ball and a few pieces of worked flint and quartz. 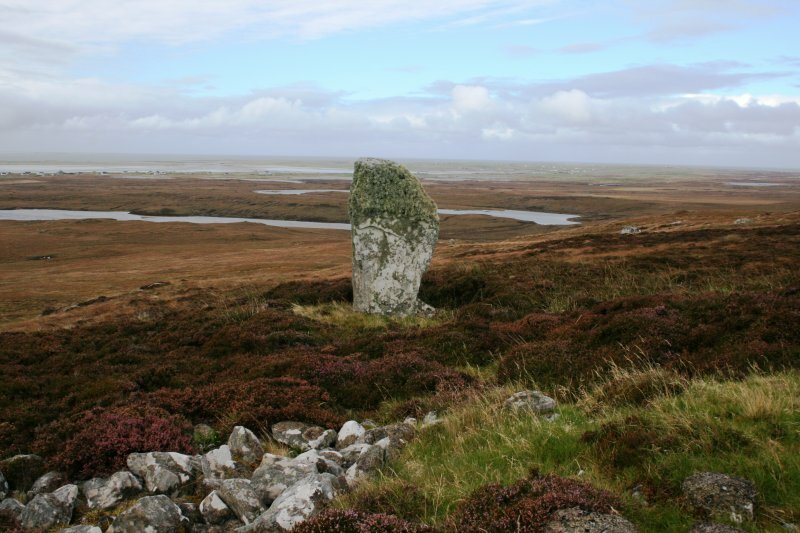 There is a standing stone a short distance from the south-west corner of the cairn. In the north-east corner of the cairn, an amorphous hollow is all that remains of an iron-age dwelling. The inhabitants apparently used the chamber itself as a cooking pit and large quantities of pottery were found in the house and in the chamber. The finds are now in NMAS. Situated on a terrace on the SW flank of Unival, this chambered cairn is largely as described and planned by Henshall. 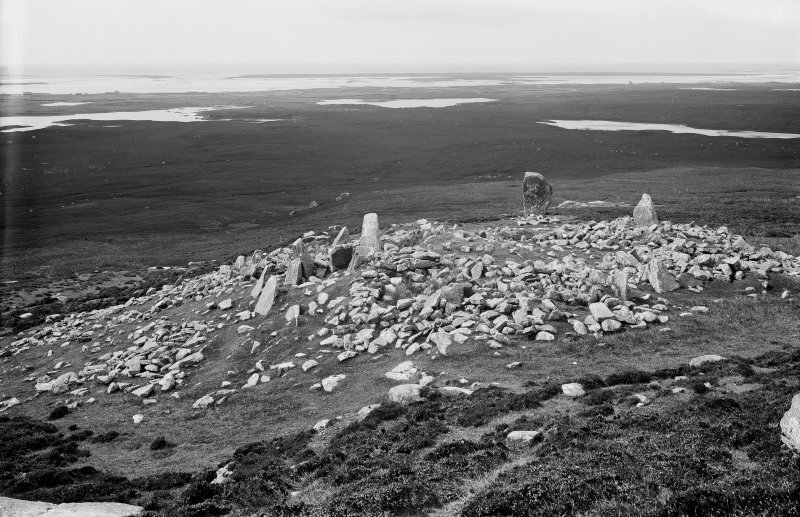 Though the cairn is said to be ‘almost square in plan’, it may be more D-shaped, with the façade on the ESE bowing outwards and the NNW and SSW sides narrowing slightly towards the rear, WNW, side. 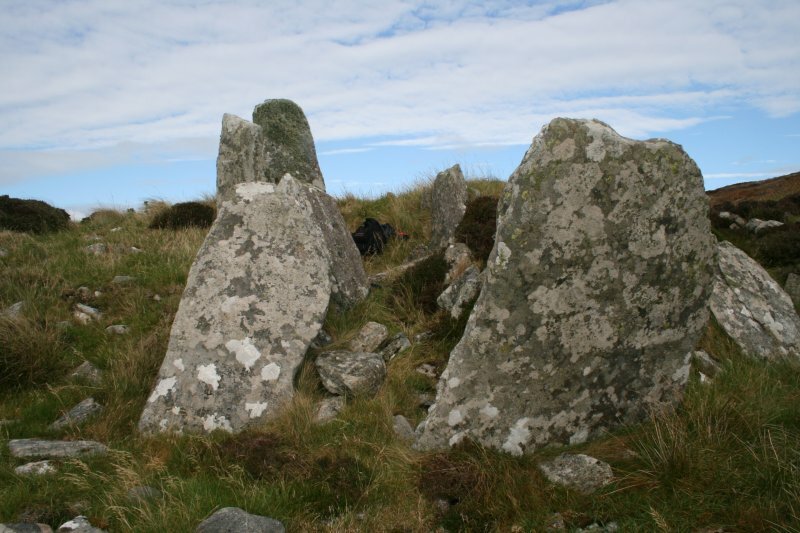 The cairn is grass grown with loose stones strewn across its interior and is defined by a peristalith of large slabs with little evidence of drystone masonry surviving between them. What may have been the stone forming the WSW corner lies flat, partly hidden in the heather. The entrance is more or less central to the façade with a short passage 1.4m long leading to an oval chamber; both the passage and chamber are set askew to the axis of the facade. Seven slabs make up the chamber, the tallest standing 2m high at the rear, W, end. The axis of the chamber extends through this slab and coincides not only with the tallest stone still standing on the WNW side of the peristalith, but also the largest stone on the façade. The remains of an Iron Age house (NF86NW 18) overlie the E of the cairn, while on the WSW, 7m beyond the peristalith, there is an impressive standing stone. This measures 1.45m in breadth by 0.15m in thickness and stands 2.6m in height in a water-filled peaty hollow with some chocking stones exposed around its base.